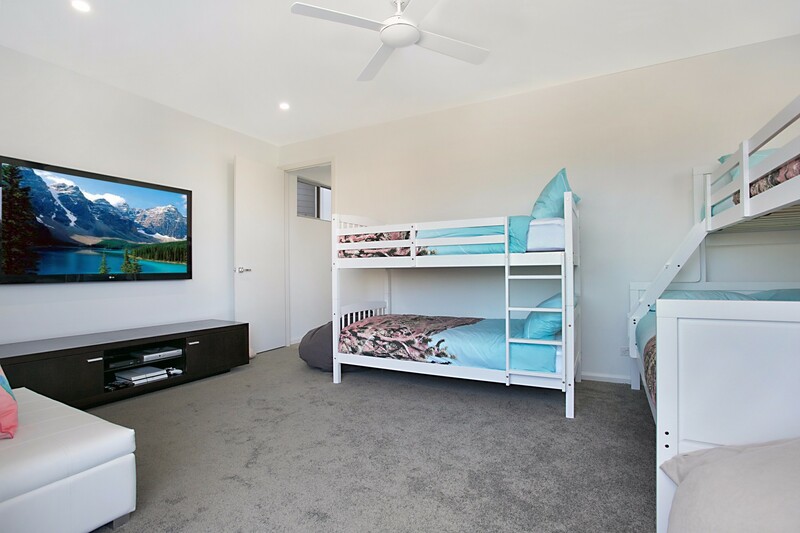 Ideal for large groups and families, Pacific Breeze holiday rental in Broadbeach Waters welcomes up to 12 guests (if the group includes children). 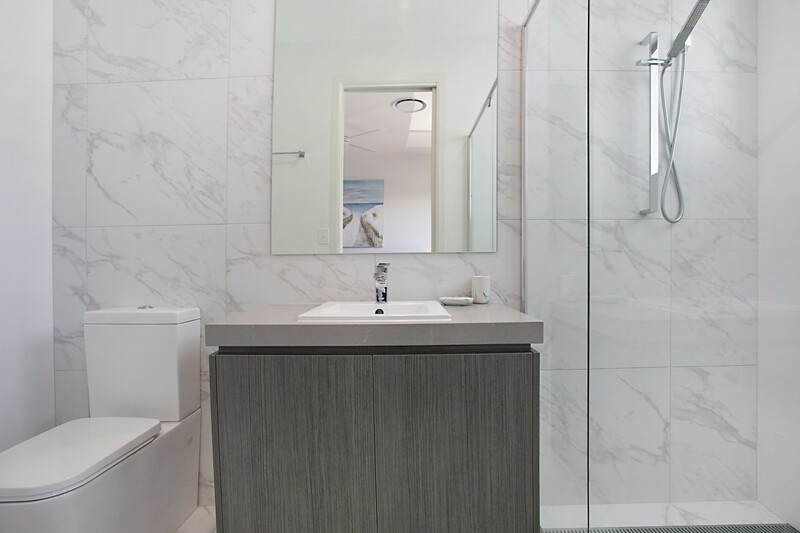 There’s space for everyone to spread out with 5 bedrooms and 4 serene bathrooms, including 3 ensuites. 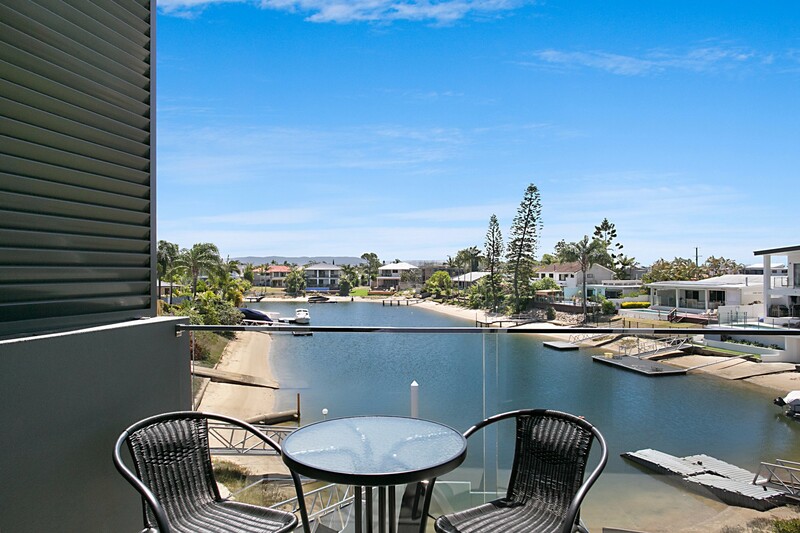 The upper balcony provides views of Broadbeach skyline while the lower terrace is perfect for recharging your batteries with days spent by the private pool overlooking the canal. 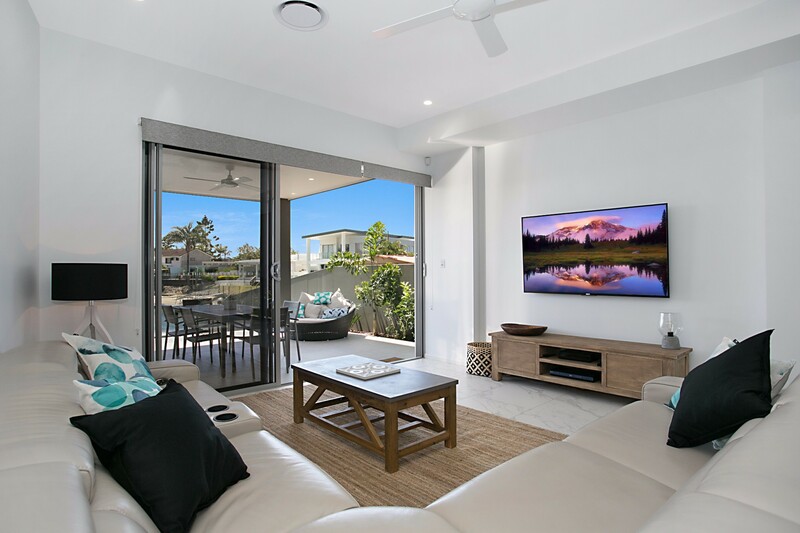 A comfortably furnished lounge is the place to curl up on the couch and watch your favourite movies and sports on Foxtel TV. 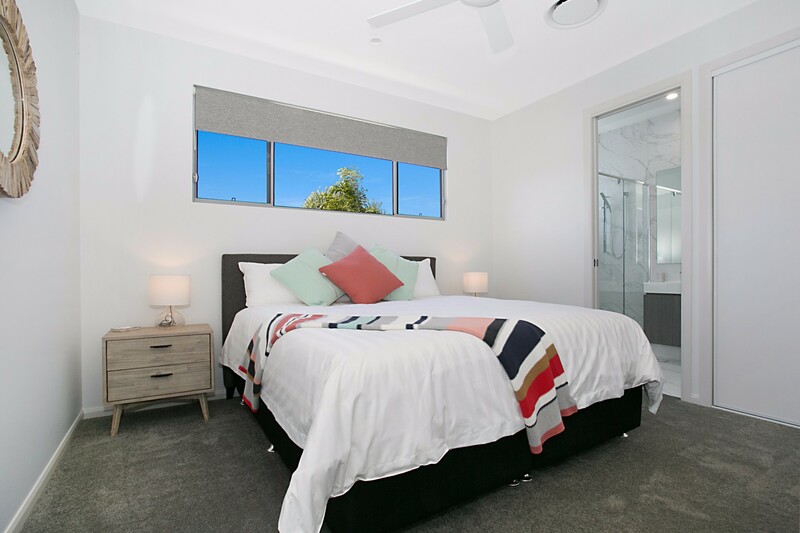 Families can head to the beach, just 1km away from this enviably located Gold Coast holiday rental. Re-group in the evenings for BBQs beneath the stars on the pool terrace. With Pacific Fair, Star Casino and restaurants all within walking distance you can count on leaving the car in the garage for the duration of your stay. White walls and smooth lines define the contemporary living space with a cosy corner sofa designed for shared chit-chat and watching TV. Fling open the patio doors for direct access to the BBQ terrace, pool and those stunning canal views. There’s a modern dining area for sharing take-out meals and gossip over a chilled bottle of wine. The separate kitchen is a chef’s delight - fully equipped with everything you need to make life easy. Stock the fridge with drinks and goodies and even the cook can put his or her feet up! Better still, light up the barbie and dine alfresco beneath the stars. Air-conditioned bedrooms are modern and spacious with ceiling fans (excluding the bunk room, for safety reasons). Pick a room with a balcony and wake up to stunning views. 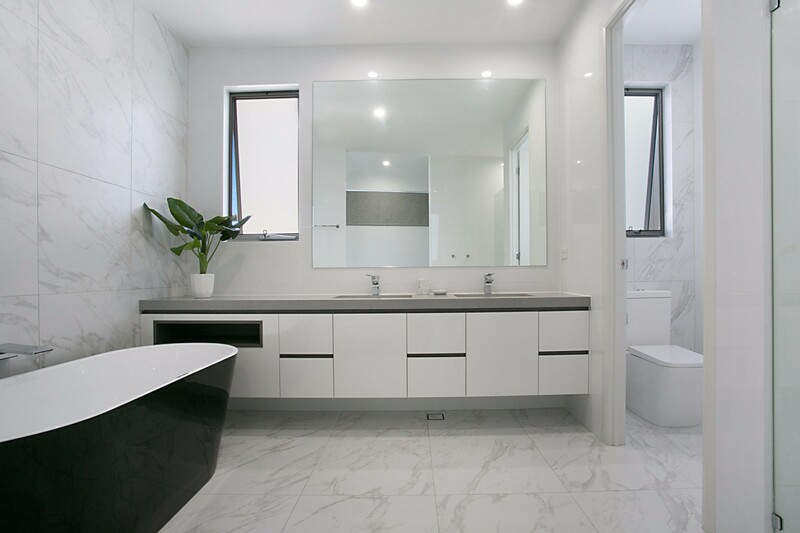 Guests have use of 4 modern bathrooms all fitted with showers and/or bathtub. The stand-alone slipper tub is perfect for long relaxing soaks (and there’s room for two!). 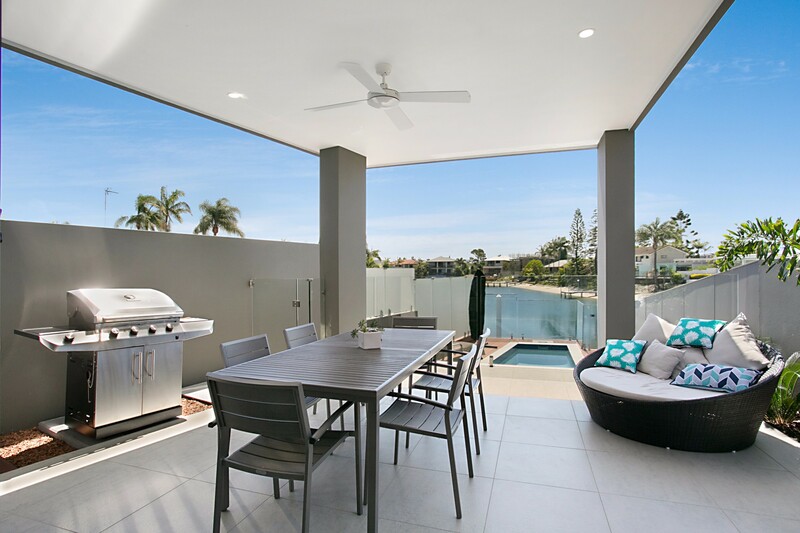 It’s hard to pull yourself away from the outdoor terrace with canal views, covered BBQ area and lounge chairs. It’s the perfect space for enjoying cool tropical drinks and a good book with the occasional dip in the pool to cool off. Garage parking for 2 vehicles plus off-street parking. 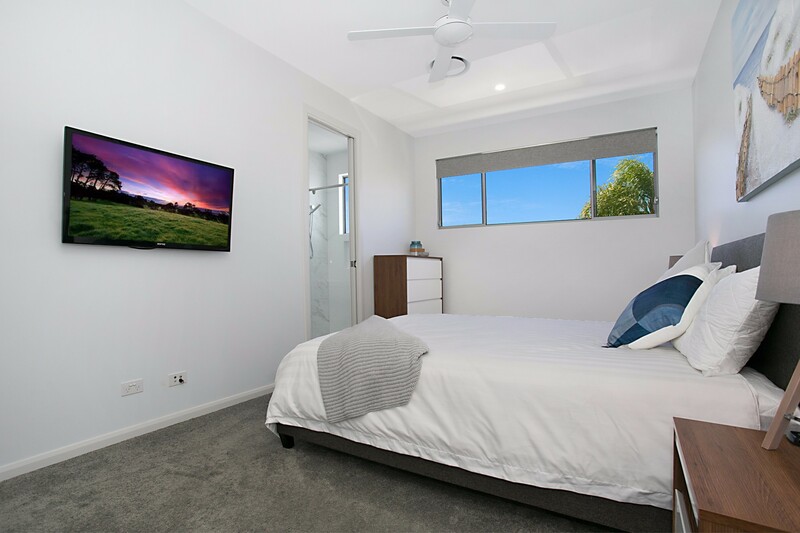 This family-sized holiday rental in Broadbeach Waters is within walking distance of the sandy surfing beach, restaurants and local shops. Spend the day shopping at the extensive Pacific Fair which offers over 400 shops, boutiques, restaurants and amenities. Plan an adults-only evening of fun at the Star Casino or perhaps book a table at Dracula’s Cabaret Restaurant Gold Coast. 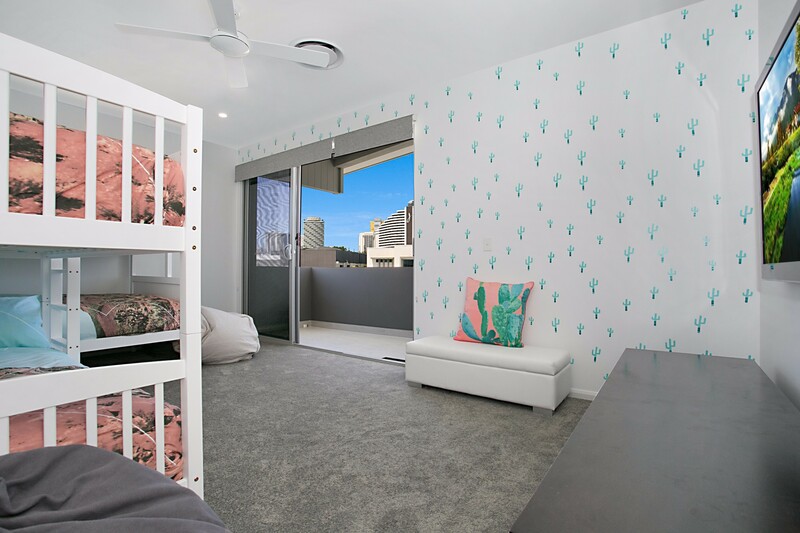 This centrally located Gold Coast holiday rental is a great base for exploring arts and crafts markets and local street art. 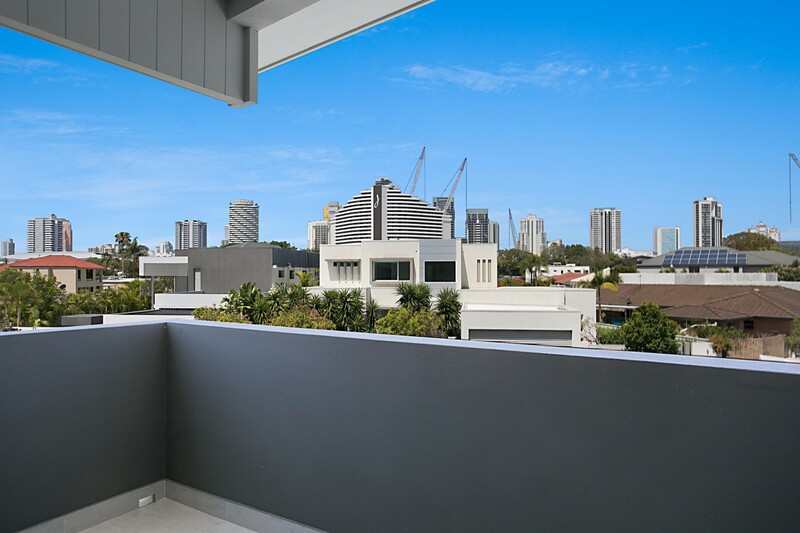 Neighbouring Surfers Paradise 6km away offers great views of the high-rise architecture from the Skypoint Observation Deck. 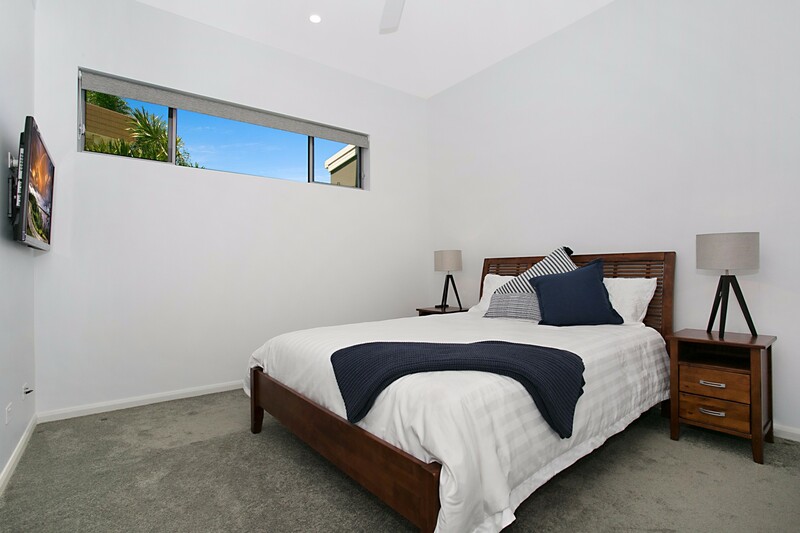 Easy to reach, Pacific Breeze is 22km from the Gold Coast Airport and 80km from Brisbane International Airport. 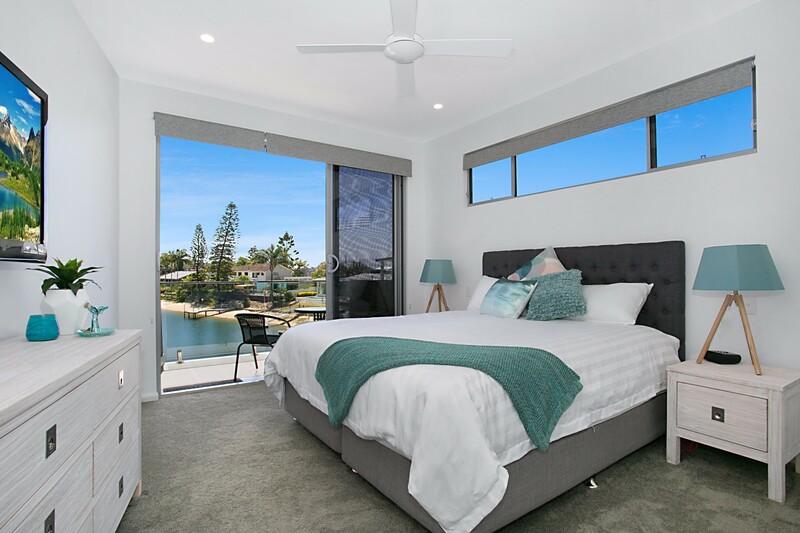 Pacific Breeze is a prime Gold Coast holiday home in Broadbeach for 10-12 celebrating family reunions, groups and weddings. 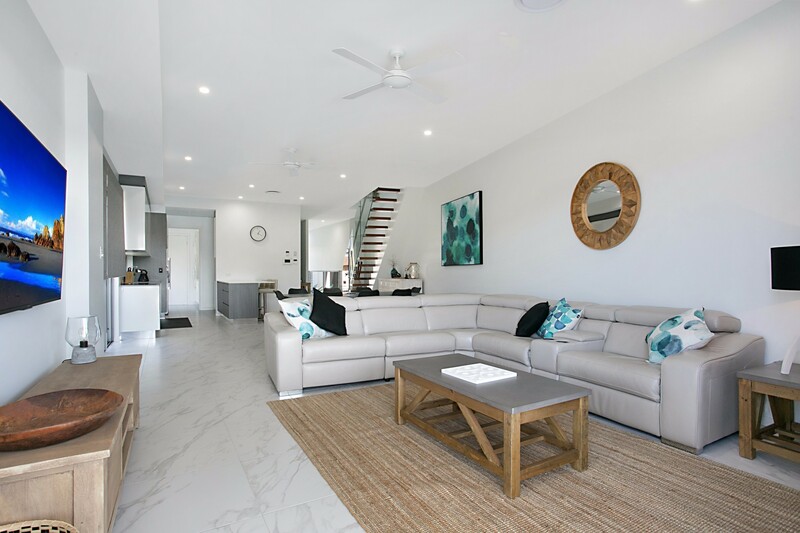 Close to the beach, shops and with its own canal front private pool, it is the perfect base for hanging out with friends or celebrating in style. This house is just amazing in every way, the location the house the views the pool everything was just perfect.It was our first trip to the gold Coast and this house made the experience even better .The location is fantastic walking distance to the Pacific Fair shops.Everything was just so clean and user friendly and we would totally stay here again and actually are dying to book and go back again soon!! Would totally recommend this house to anyone and dealing with the agents at A Perfect stay was a breeze too. The house was amazing and we would totally book it again to stay there. Everything about the holidays was just fabulous and the house just made it perfect!!! We were a group of 5 colleagues attending a conference at the ICC. It was the perfect location. 5 bedrooms, 4 with ensuite. Walking distance to ICC and Pacific Fair. Lovely canal outlook and relaxing deck that everyone could sit around after a long day at the conference.